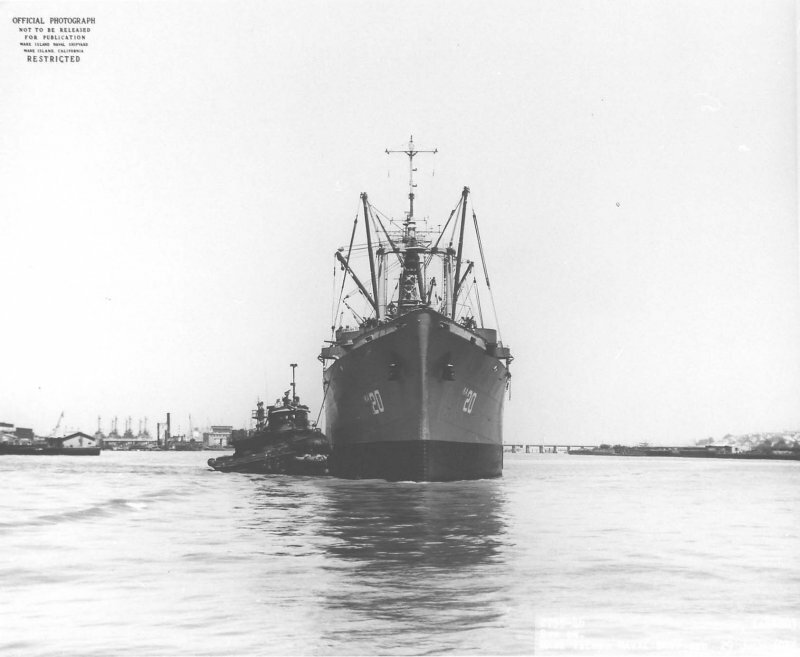 Laid down, 9 March 1943, as a Maritime Commission type (C2-S-B1) hull, under Maritime Commission contract (MC hull 204) at Federal Shipbuilding and Dry Dock Co., Kearny, N.J. 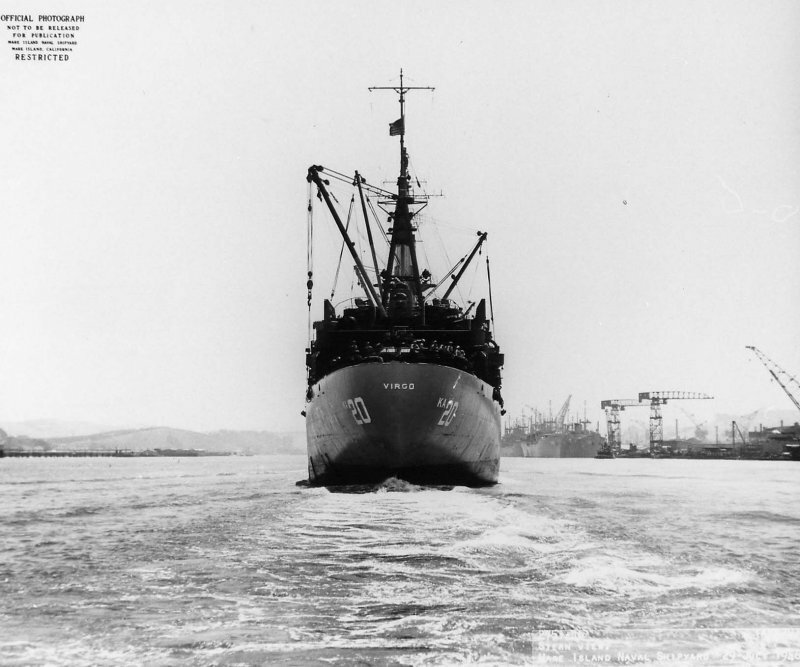 Laid up in Columbia River Group, Pacific Reserve Fleet, Astoria, OR. 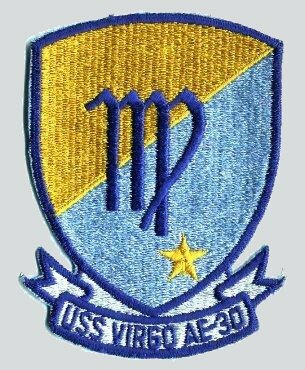 Custody transferred to the Maritime Administration (MARAD) for lay up in the National Defense Reserve Fleet, Astoria, OR..
Decommissioned, 18 February 1971, at Mare Island Naval Shipyard, Vallejo, CA. 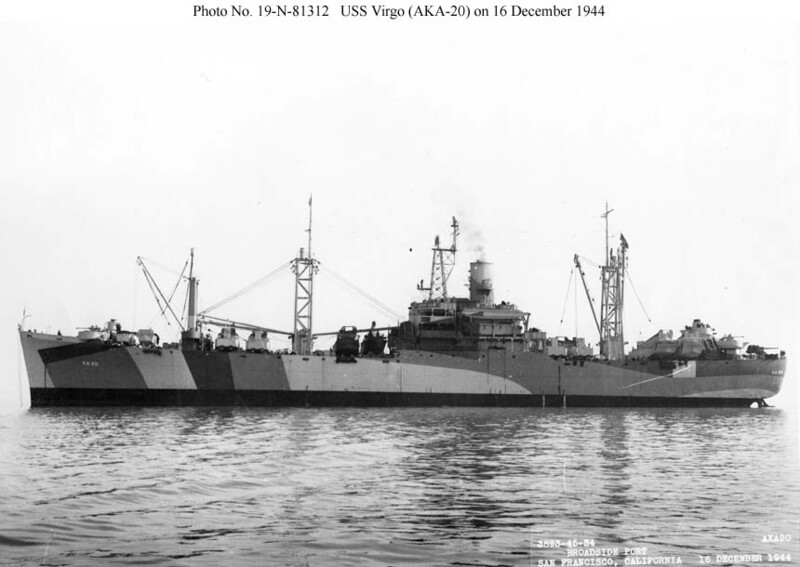 76k USS Virgo (AKA-20) near the US Naval Dry-docks, Hunters Point, San Francisco, CA., 16 December 1944. 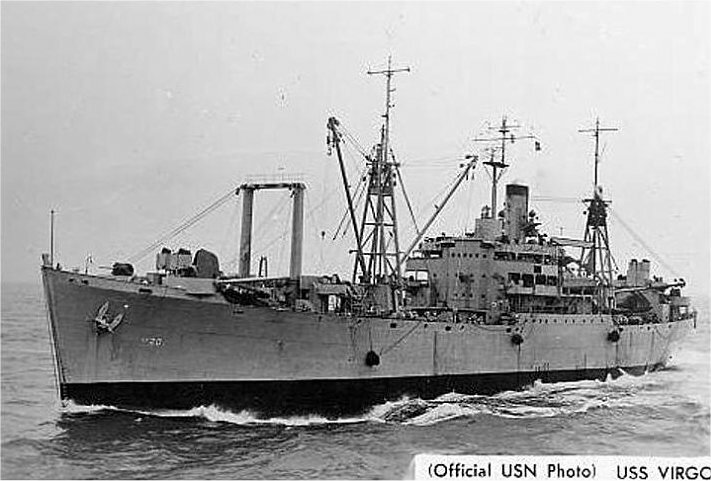 Note her newly-fitted lattice radar mast. 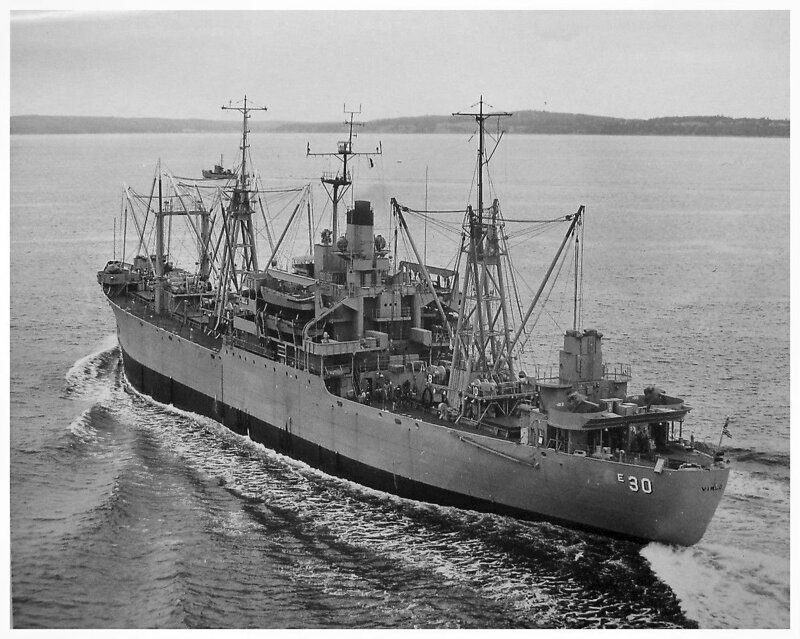 Three of the six early Federal-built units (AKA-17, 19, and 20) had this type of radar mast added between April and December 1944, all at this yard, while the other three received pole masts. This lattice mast was similar to the one fitted in the later Moore-built units but was located further forward and supported the small anti-aircraft fire control director that was mounted on a stand over the bridge in the Moore ships. 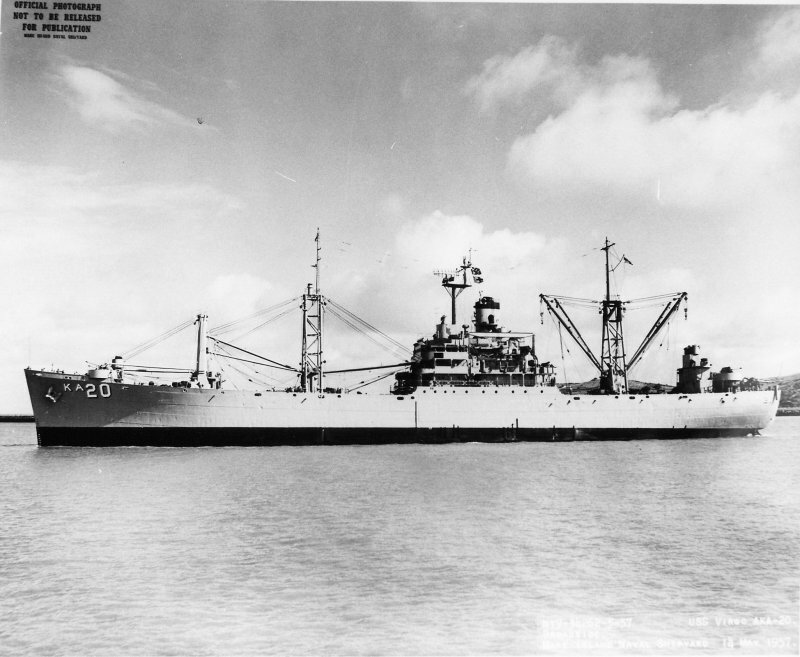 86k Broadside view of USS Virgo (AKA-20) underway in the Mare Island channel, 29 July 1946. 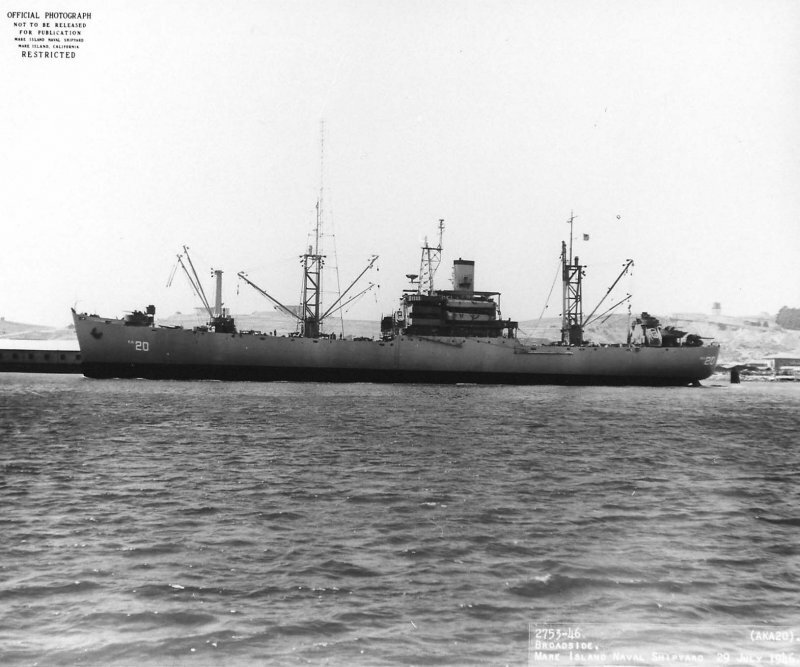 56k Bow on view of USS Virgo (AKA-20) underway with assistance of an unidentified tug off Mare Island Naval Shipyard, 29 July 1946. 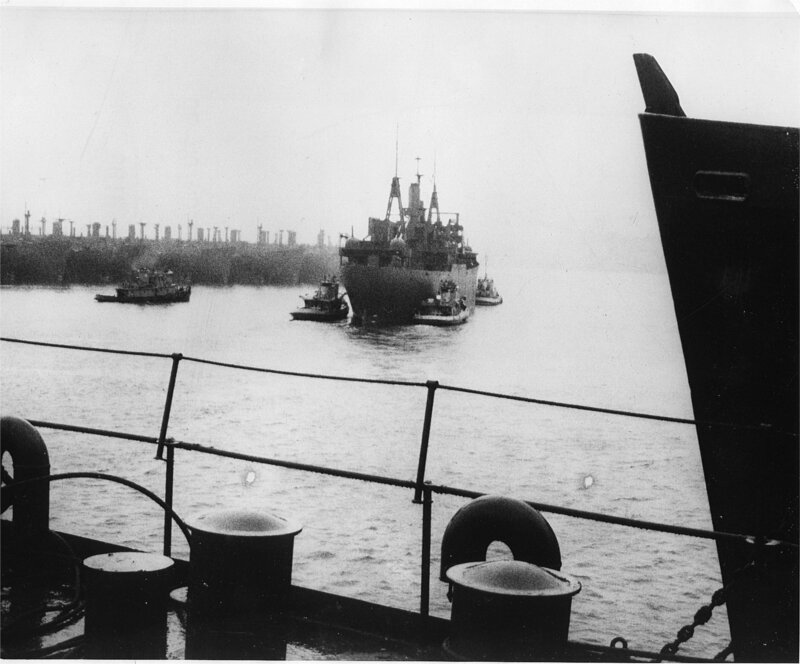 Ships in the background are part of the 19th Fleet (Reserve Fleet) moored at Mare Island. 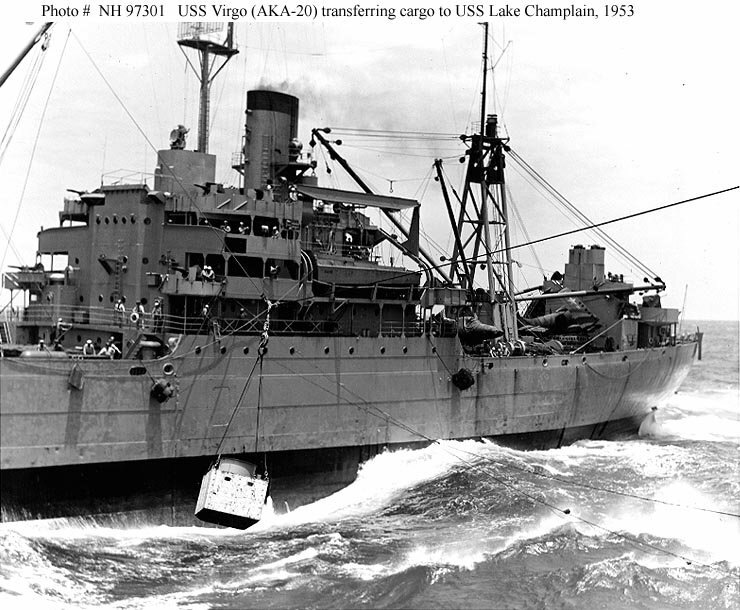 401k USS Virgo (AKA-20) underway while inbound on her way into San Diego Bay, circa late 1940s-early 1950s. 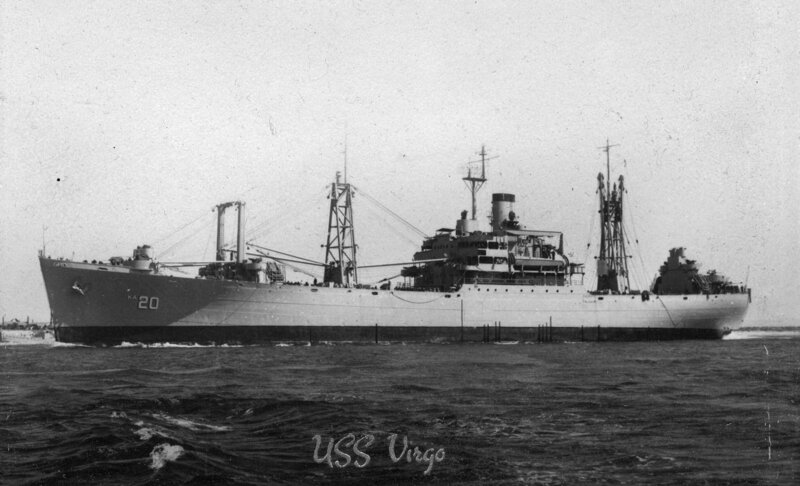 70k USS Virgo (AKA-20) underway, date and location unknown. 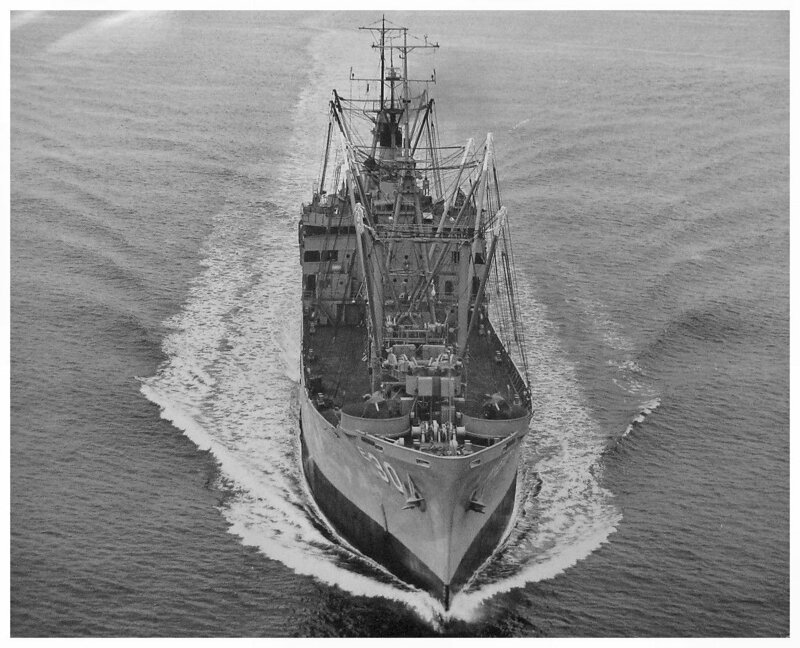 87k Broadside view of USS Virgo (AKA-20) off Mare Island Naval Shipyard, 14 May 1957. 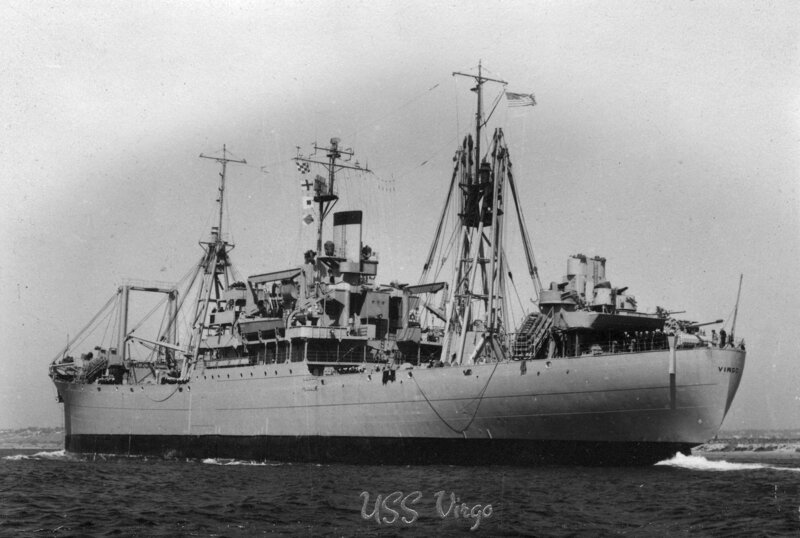 Virgo was under repair at Mare Island from 5 March to 13 May 1957. 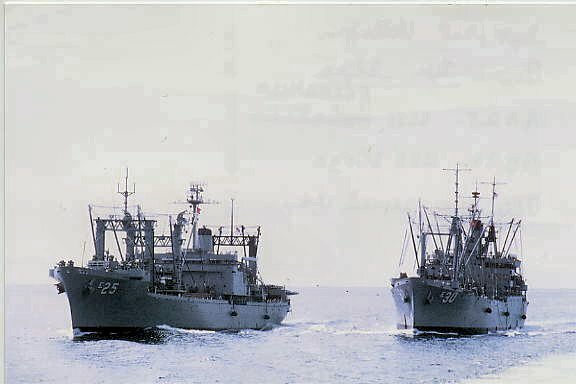 118k USS Virgo (AE-30) as she steams alongside another ship in the Gulf of Tonkin during a replenishment at sea. 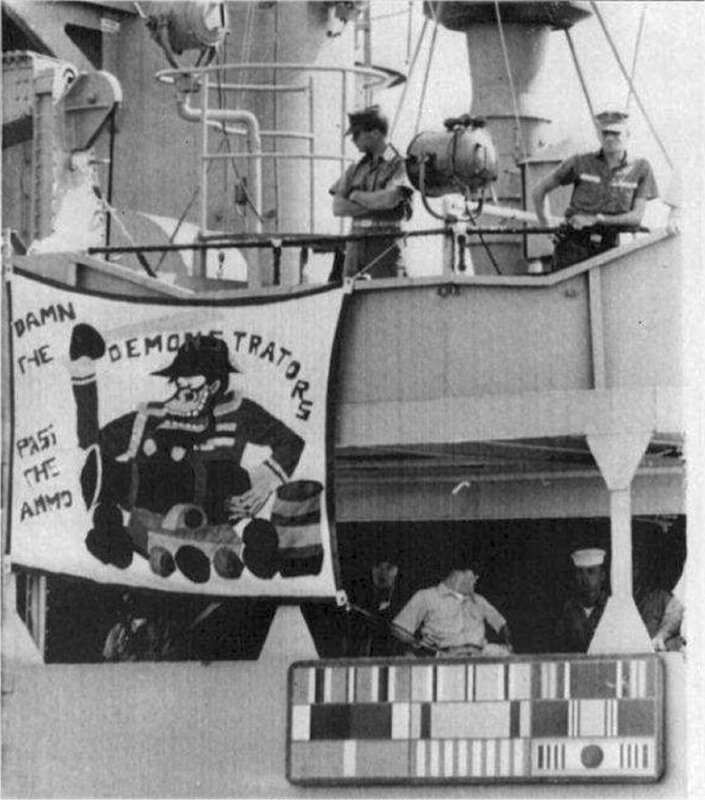 The sign reads "Damn the Demonstrators Pass the Ammo" a retort to the anti-war demonstrators back in the US. 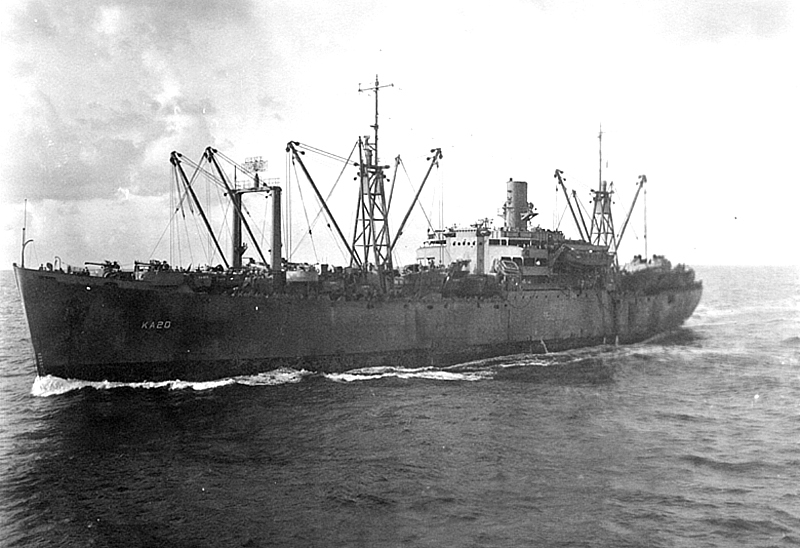 The ship was cruising 60 miles north of the border between South and North Vietnam and 8 miles off the coast of North Vietnam. 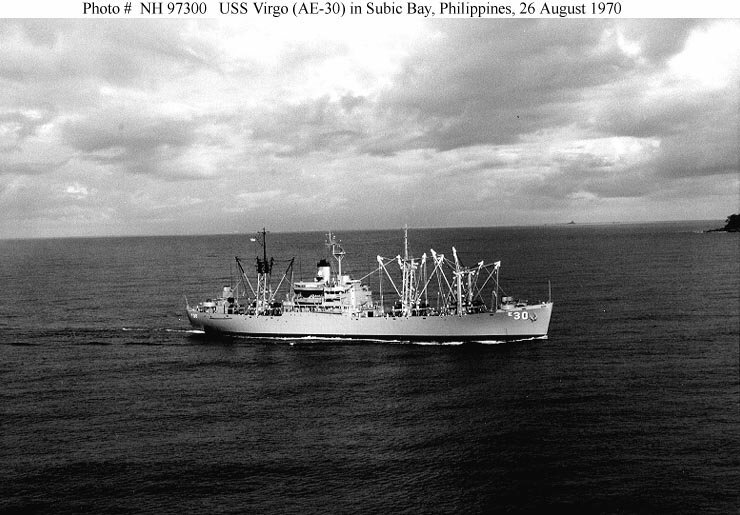 The Virgo was carrying ammunition for destroyers which were shelling the coast of North Vietnam. 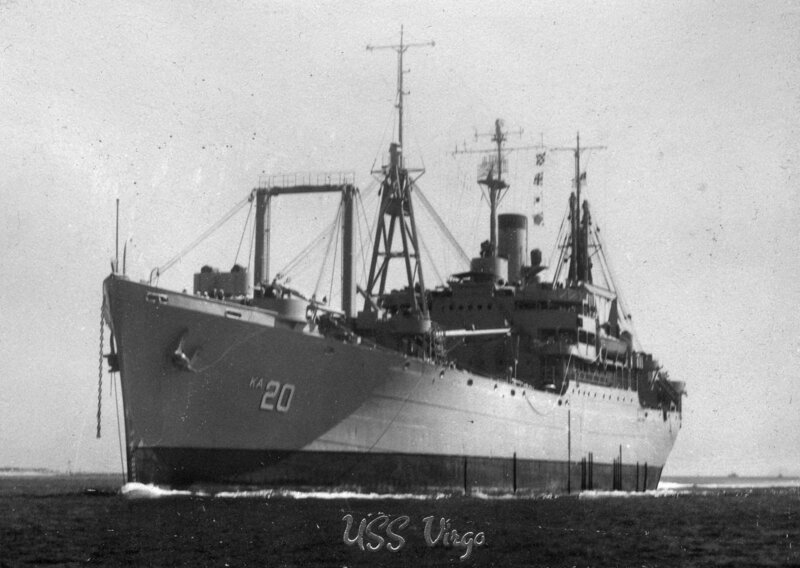 243k USS Virgo (AE-30) underway in harbor, date and location unknown. Richard Miller BMCS USNR Ret. 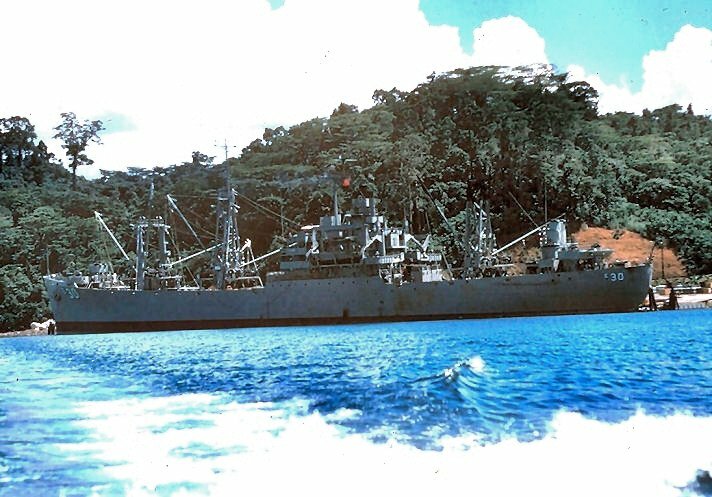 1061k USS Virgo (AE-30) moored pierside at Naval Station Subic Bay, Luzon, Philippines in 1969. Richard Miller BMCS USNR Ret. 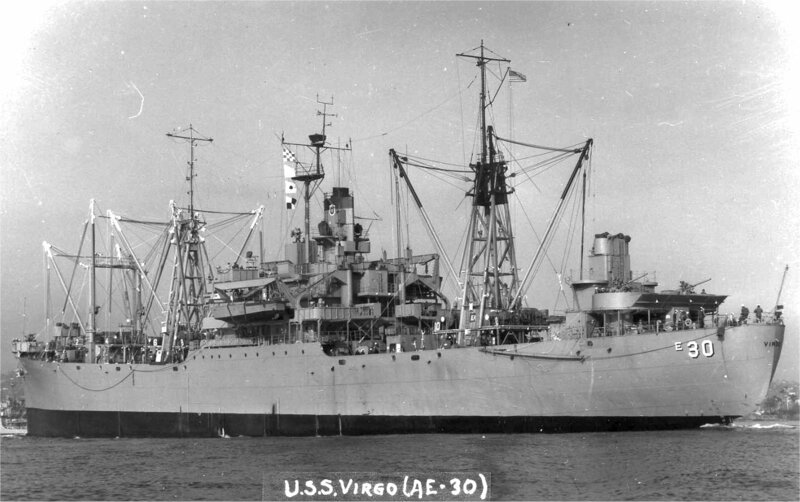 337k Bow on and port quarter views of USS Virgo (AE-30) departing NAD Concord, CA. in 1970. 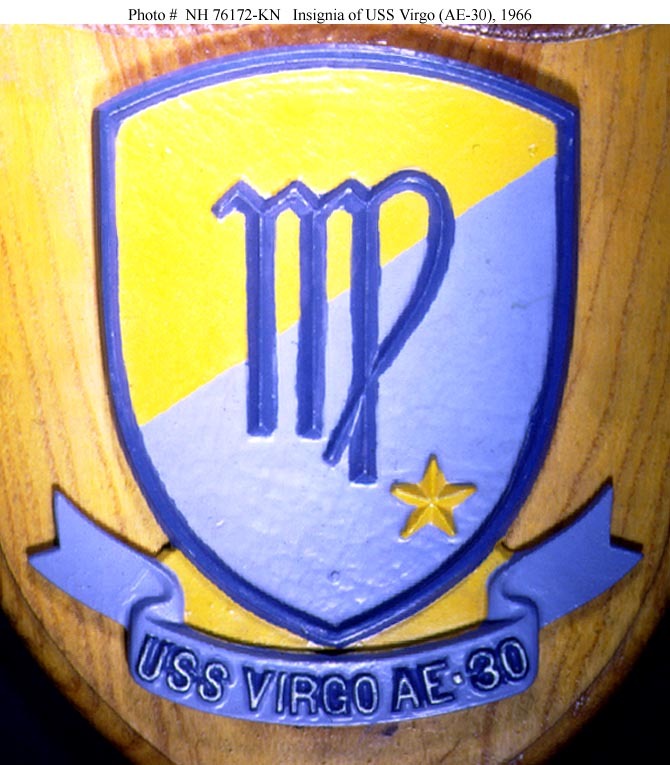 95k USS Virgo (AE-30) ship's plaque, features an insignia design adopted in 1966.